About 5,300 years ago, people first pulled metal out of the ground and shaped it into tools. One of the first tools made was a sword, and shortly after that the sport of fencing was born. Dating back as far as the Egyptian pharaohs, people have been blunting weapons, donning safety equipment, and playing with swords. We’d like to help you get involved in this tradition. Modern fencing has its roots in the swordplay of the Renaissance in Europe. The gentry would practice their swordplay, test one another, and occasionally fight duels. From this tradition, we get the foil (a practice weapon of the era), the epee (the duelling weapon of the era). In the 1700s, the saber became a popular weapon for cavalry troops, and militaries trained soldiers to use them using theories adapted from foil. 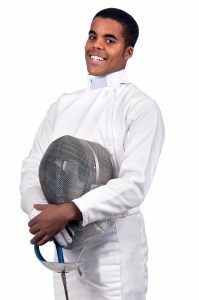 Over the years, fencing has largely embraced the sporting nature of the art and focused on tactics, precision, and safety. One of a few sports to be part of every modern Olympic games, fencing requires self-discipline, clearness of thought, and a willingness to act. We are a finesse based martial art with an unparalleled safety record. The sport is exciting, challenging, and the most fun you can have with 3 feet of steel. Fencing is sword play. The goal of the bout is to touch your opponent more than your opponent touches you. This is done offensively by attacking, defensively through parries and ripostes, and counter-offensively through being trickier than your opponent. Regardless of the tactical framework chosen, the fencer has to control the distance and flow of the bout to be successful. Right of Way (aka Priority): this is the concept that is used to frame “what is a good idea” while fencing. When dueling was a real prospect in a fencer’s life, tactics revolved around being the guy who walked home at the end. To this end, whichever fencer initiates an action first had the right to finish the action. The other fencer had to do something to disrupt this action. So if my opponent begins an attack against me, I have to either block it (parry), step back, or somehow avoid my opponent’s blade. If I do this, I have a right to respond. If I don’t, I’m counted as hit. Right of Way is a convention in foil and saber – if both fencers hit, only the one with priority can score. If no one has priority, no one can score. In épée, it’s just a good idea – who ever hits first scores, or both score if the his arrive together. Regardless of weapon, right of way provides a good tactical framework to fence with. Epee: The whole body is target, and the goal is to hit your opponent before they hit you. The weapon is based on the concept of dueling to “first blood,” where the first person cut loses. Foil: Originally developed to teach the duel, foil is a point weapon like epee, but only the torso counts for points. 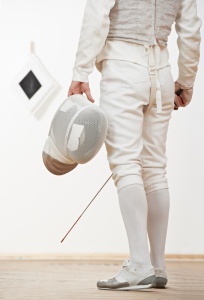 Additionally, a fencer has to have “right of way” to score if both fencers hit. This is to teach a fencer to defend and not just attack first. Saber: Target is from the waist up, and right-of-way determines the point. Descended from the cavalry saber, this fast-paced weapon lost the horses but not the charging. The beginner class will introduce you to the fundamentals of footwork and bladework. You will get to try all three weapons – epee, foil and saber – in a fun and safe environment. Conditioning, footwork and bladework sessions will prepare your body and mind for any on-strip situation you might encounter. 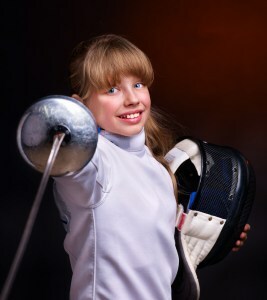 These are held separately for youth fencers and combined into one hour-long practice session for adults. Conditioning exercises build strength and endurance. Footwork practice trains the lower half of your body to move efficiently and without giving your intentions away to your opponent. Bladework and tactical drills do the same for your upper half and your mind.